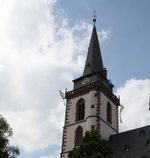 The tower of St.Ursula’s Church in Oberursel will be open to the public on Saturday, 6th October 2018 between 3pm and 5pm. The tower of St.Ursula’s Church in Oberursel will be open to the public on Saturday, 1st September 2018 between 3pm and 5pm. The tower of St.Ursula’s Church in Oberursel will be open to the public on Saturday, 4th August 2018 between 3pm and 5pm. The tower of St.Ursula’s Church in Oberursel will be open to the public on Saturday, 7th July 2018 between 3pm and 5pm. The tower of St.Ursula’s Church in Oberursel will be open to the public on Saturday, 2nd June 2018 between 3pm and 5pm. The tower of St.Ursula’s Church in Oberursel will be open to the public on Saturday, 5th May 2018 between 3pm and 5pm. The money raised this year will mainly be going towards projects to help children in India. With the whole country taking part, it is not unusual to raise over €40 million. The tower of St.Ursula’s Church in Oberursel will be open to the public on Saturday, 7th October 2017 between 3pm and 5pm. The tower of St.Ursula’s Church in Oberursel will be open to the public on Saturday, 2nd September 2017 between 3pm and 5pm. The tower of St.Ursula’s Church in Oberursel will be open to the public on Saturday, 5th August 2017 between 3pm and 5pm.